„Da kommt Freude auf bei den europäischen Piratenstationen – endlich wieder einmal Post aus „Bella(barba) Italia“!!!!!!!! More to this fantastic Listener and friend of all Piratestations on the special Web site: http://www.schoechi.de/bellabar.html. PS: Da der RR bis jetzt nocht nicht bestätigt wurde, gab es zwischenzeitlich schon div. „Erinnerungsreporte“ (4 an der Zahl)!!! 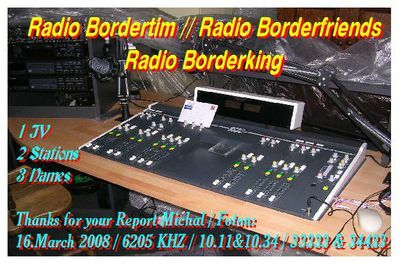 I was very pleased to listen your station from Mount Donato, hill near my town, on 30.12.2007, on a frequency of 6276 kHz, at 10.25 time UTC. The overall merit of the reception quality is fair. 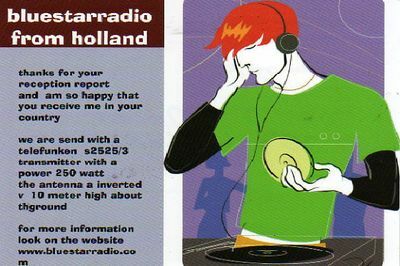 Details: Dutch,English and German languages/Christmas songs/Greetings to listeners. I am sorry that my reception report has so few details, but that is because I heard you for such a short time and under very bad reception conditions. 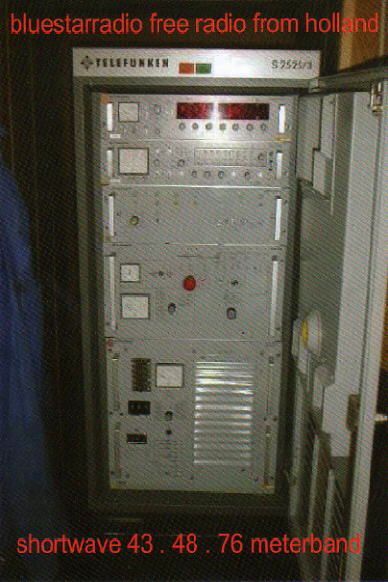 My receiver is a ICOM R-75, connected to a Long-Wire antenna. My name is Giovanni, I live with my family in the city of Bologna, in the North of Italy, the population is around 380.000 inhabitants. Here is a little bit information about myself: I am 64 years old and I am married with Lucia. 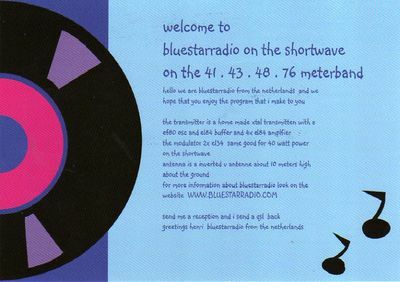 I started with the radio hobby back in 1975, mostly interested in FM/AM/Satellite -DX when I got my first radio with shortwave dial. Since then I listen to all kinds of stations around the world and I am still fascinated of this hobby. Beside DXing I like to travel abroad. My favourite part of the world is Asia. I have two QTH’s which I use to DX: at home and a DX-cottage located at my soon farm with potential for long beverages during wintertime. Bologna, is located on the centre of Emilia Romagna(one of the 20 Italian regions). The town is founded by Etruschi and Romans, the city is very very important for the big and historical university, democracy, industry and gastronomy. Bologna is surrounded by a medieval town-wall and it has also got many beautiful palace and medieval church. The climate is moderated for the Appennino(mountains), average mean temperatures are 25°/39°C in summer and -9°/12°C in winter. 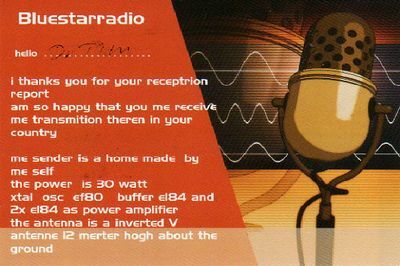 I would be very happy if you could send a me a card or letter of verification, to confirm my reception and some stickers about your radio. Please indicate the frequency, the date and the time of my listening. I very much hope that you will attend to this request and many thanks in advance for your assistance. Hier der überaus detaillierte RR unseres Freundes BELLABARBA an TOP RADIO. Exakt denselben bekam u.a. 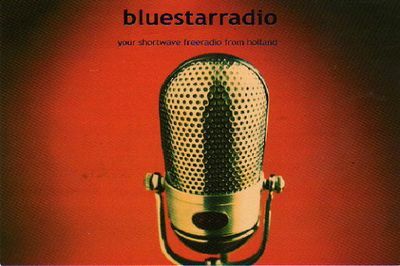 auch RADIO JINGLE BELLS und noch div. andere Stationen! Auch zahlreiche andere Stationsnamen wurden in der Vergangenheit im exakt den gleichen Reception Reports bedacht!!! 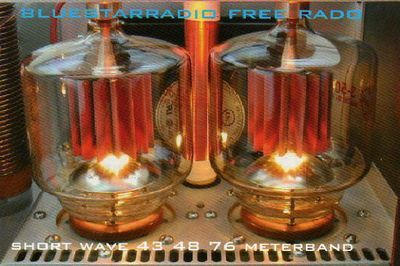 I was very pleased to listen your station from Mount Donato, hill near my town, on 31.12.2007 & 01.01.2008, on a frequency of 3925 kHz, at 20.14 & 00.46 time UTC. 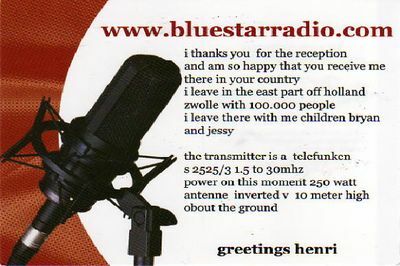 So sieht es aus – das neue Info Paket von BLUE STAR RADIO das in diesen Tagen in der NEWS Redaktion eintraf! 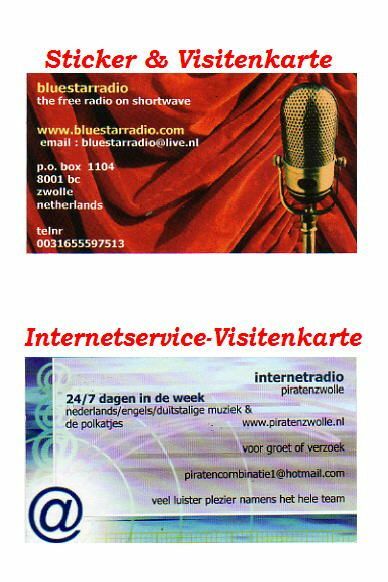 6 QSL’s, jeweils ein Sticker und Visitenkarte im gleichen Design sowie die Visitenkarte des Internet Services! Fotos vom Holland Trip 2008 gibt es hier zu sehen. 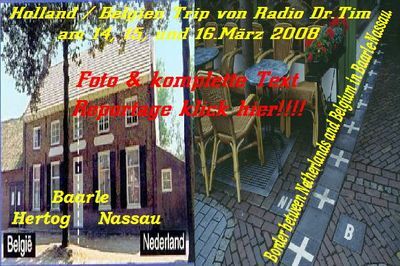 Holland Trip von Radio Dr.Tim am 14, 15, und 16.März 2008 mit Besuch bei R.Borderhunter, Radio Brigitte sowie JV Project Radio Bordertim. Ein ganz phantastisches JV-Wochenende ergab sich aus dem Holland/Belgien Trip von DR.TIM am 14. 15. und 16.März. Zwar war der „DOC“ am Sonntag körperlich am Boden zerstört – aber um keinen Preis der Welt würde dieses „Testmeeting“ rückgängig gemacht werden sollen und dürfen! Der sich im Laufe des Sonntags herauskristallisierte Stationsnamen BORDERTIM war ganz sicherlich einer der schönsten Hollandtrips im Laufe der Stationsgeschichte. Allein schon die fast 500 KM lange Anreise hatte mich bei der Ankunft gegen 18.00 am Freitag physisch an den Rand der Erschöpfung gebracht! 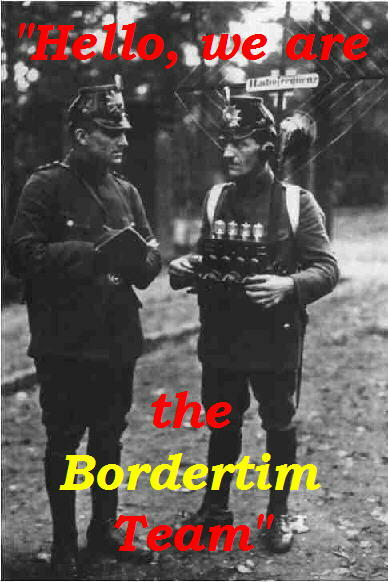 Nachdem ich erst wieder einmal die ganze FA.BORDERHUNTER begrüßt hatte, sorgte MRS.BORDERHUNTER für das leibliche Wohl. 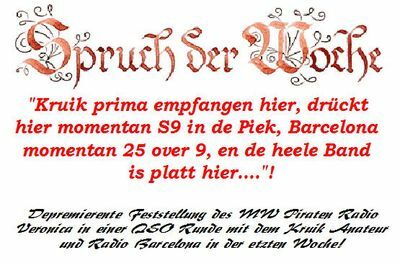 Sie betrachten Weblog Archive vom März, 2008.